Ships have sailed through human history for thousands of years. Sometimes, their dramatic voyages have even changed the course of the world--bringing cultures together in peace or conflict, playing a role in wars and revolutions, and transforming societies. Greenpeace's Rainbow Warrior, a key player in the environmental movement. 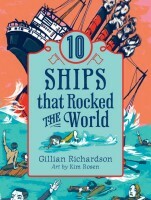 With a rich variety of photos, maps, and striking illustrations, 10 Ships that Rocked the World reveals the crucial role ships played in some of history's most significant dramas.